I'm right there with you on lots of the things that you said. I too have a phobia of drinking bathroom water. Black heads or white heads...bring them on...only mine though! 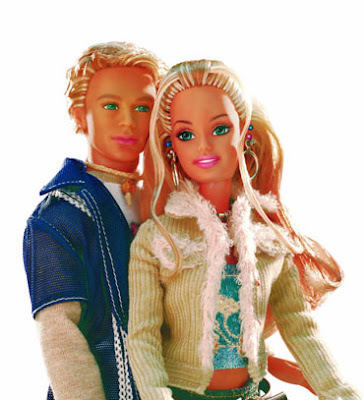 My friend and I played Barbies for years, I just don't remember if it was before or after age 13 that we stopped. I hate horror movies, but can handle scary movies better than my husband who has nightmares vivid nightmares that usually includes me getting hit or attacked at night because he is dreaming that spiders or something is trying to get him. True story! As for the Jonas brothers...I know who they are, I haven't really heard their music, but AMEN to the pants thing! Last week when your parents visited I prepared a nice home cooked meal. Your stepdad asked if I had any Windex. I thought he was insulting my house keeping skills. Turns out he just wanted to season his food. Note to self send an e-mail Do not call. Good to know!!!! Sorry!!! Sorry, did we actually want the Jonas Brothers to reproduce? I think I've got bigger concerns. And boy I love email. I like to talk on the phone, once I get going, but mostly, I prefer email. Especially for someone I'm not so close with. 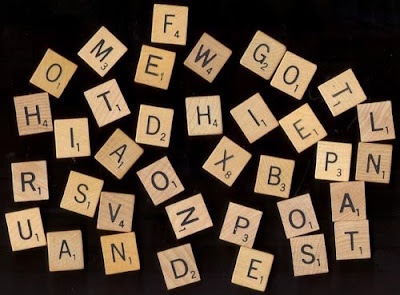 If you change the N to a B on the last row of letters in your Scrabble picture, you can mix the letters on that bottom row (plus the P right above the E) around to spell Budapest. No, it didn't take me forever to figure this out. Maybe I'm just gifted too. So there. :) Bring it. Okay, so I lose almost every time I play with B. That's why I haven't played in a while. I still don't get Barbies???? I've always hated the kitchen sink water. I always drink the bathroom water. Maybe it's because I clean the bathroom and it's up to Rob to clean the kitchen. I also just thought there was food in the kitchen sink stuck to the faucet. I'm used to drinking water in the bathroom after brushing my teeth. I don't think I have enough blog space to share all my quirks. Hey Brandi...Do you still have full on conversations in your sleep??? I seem to remember that one from being your roomy at USU!! :) Happy Christmas! Since I've eaten your food before, I am now quite disturbed about the Windex comment. It's a very good thing to remember. And I'm right with you on the Jonas brothers - those Olivia-Newton-John-in-Grease-after-she-goes-skanky-pants just aren't right. Lurker here - I couldn't help laughing at the bedroom door one. Ran across a comment of yours on Prairie Woman. I love your "confessions" so funny! My daughter is 11 and we have done some stealth Barbie buying missions...she only buys when if she is sure that she will not run into anyone at the checkout! I am nearly 28 and I'd like a Barbie for my birthday.